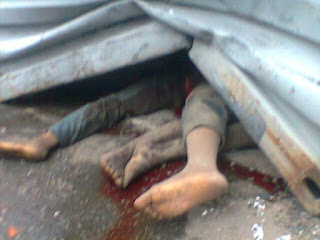 Home Nigerian News Couple that Supposed To Wed Today Killed By Truck In Ogun. Couple that Supposed To Wed Today Killed By Truck In Ogun. A truck laden with cement, belonging to Dangote factory crushed seven people including a couple to death at Ibese in Yewa North local government area of Ogun state. The accident which involved three trucks of the cement company forced the Commissioner of Police, Ikemefuna Okoye to move to the area in a bid to reduce tension in the area following an outbreak of pandemonium that led to the death of a trailer motor boy and burning of three Dangote trucks. The couple who were crushed to death while on a motorcycle, it was learnt, had fixed today (Saturday) for their wedding ceremony before the unfortunate incident. The Unit Commander of Itori Federal Road Safety Corps, Fatai Bakare while confirming the incident yesterday, blamed the accident on the recklessness of the truck drivers. According to him, six of the victims were on two motorbikes before they were crushed by the trailer. He said the bodies of the deceased had been deposited at the Ilaro general hospital morgue.